Most children’s piggy banks have an “escape hatch” that can be used for immediate access. This allowed my childhood self to learn the value of saving money (ha!) while at the same time knowing my hard-earned cash was accessible when I “needed” some of it for a life-altering purchase (comic books) at the corner store up the street. After several such purchases, my parents introduced me to Uncle Sam’s 3-Coin Register Bank, which brought savings to a new level. It was a kid-sized equivalent of a Christmas Club account, a staple of American Banking in the 1970s that forced savings all year with goal of having a fund to purchase gifts at Christmastime. Depositing more than $0.25 into the available slot and pulling the lever registered the amount of the deposit on a counting wheel AND locked the money away inside the bank. The only way to access the cash in this mini-vault was to add more money (nickels, dimes, quarters) until the register hit $10 (and displayed 00 on the counting wheel.) Only then would the front panel of the bank unlock to provide unfettered access to the riches within. The first Uncle Sam registering banks appeared on shelves in 1907, a product of the Durable Toy & Novelty Company, which had offices in Cleveland, Ohio and Hackensack, New Jersey. True to the company’s name, the banks were made of heavy gauge steel with enamel paint, making them quite rugged and kid-proof. Durable’s initial registering bank models were single-coin only. For example, the Penny Register Bank opened after a $1 worth of pennies was deposited, while the Dime Register Bank opened after $10 worth of dimes was saved. In 1923, Durable introduced the three-coin model – first in black and then in four other colors. 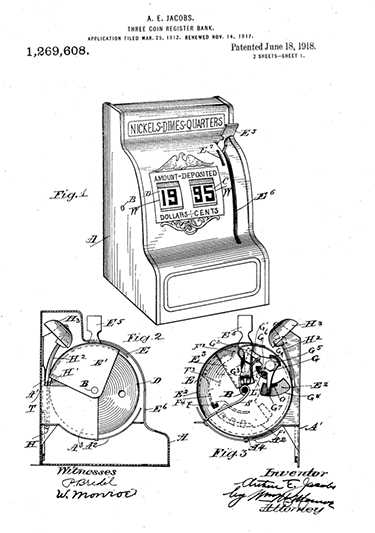 United States Patent #1,269,608, filed March 25, 1912 on behalf of A.E. Jacobs, illustrates the initial design of his three-coin register bank. 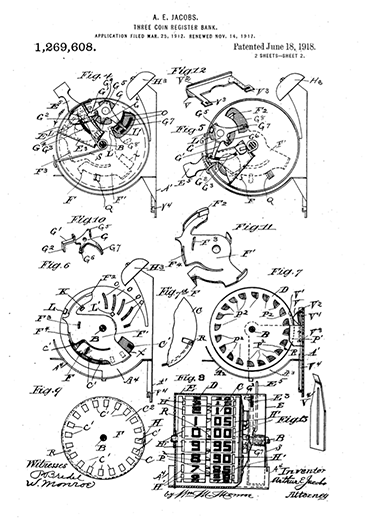 In addition to the metal casing the design centered around a counting mechanism that kept track of deposits, and a locking mechanism that was used to make funds inaccessible until a certain monetary threshold was reached. In the late 1950s, Durable Toy and Novelty Company was acquired by the Western Stamping Company, a large metal toy manufacturer in Michigan. 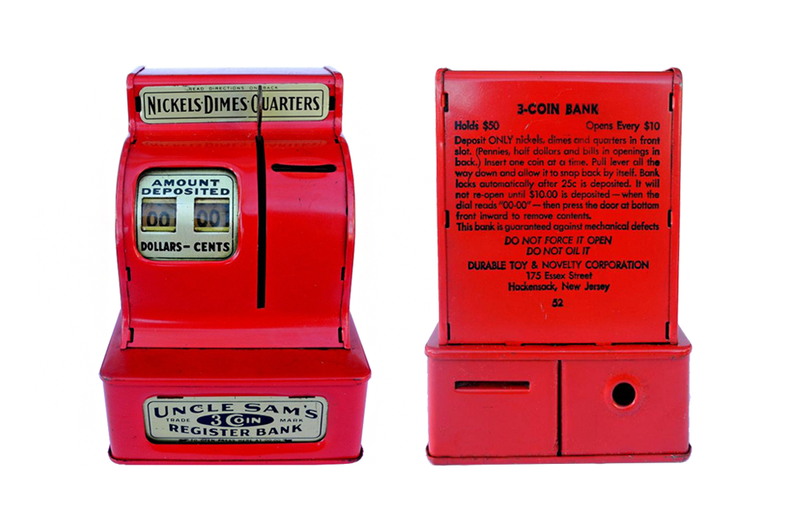 The company added the Uncle Sam 3-Coin Register Bank to its Tom Thumb line of toy cash registers. While Western Stamping continued to sell its new acquisition, cost-cutting production changes also began to appear in newer models. For example, the company substituted heavy-gauge tin for the original all-steel construction, made modifications to the internal locking/counting mechanism, and replaced the painted instructions on the back of each unit with a decal. Eventually, production of the Uncle Sam 3-Coin Register Bank was moved overseas. The demise of Western Stamping Company in the late 1970s led to the 3-coin register bank disappearing from toy shelves by the mid-1980s. In 2002, Chicago-based Rocket USA released a modern version of the Uncle Sam Bank in several colors and finishes. The Toy Manufacturers of the U.S.A. The Toy Manufacturers of the U.S.A. was founded in 1916, resulting from a meeting of more than 45 American toy makers in New York City. Released in 1961, Miss Popularity relies on a series of clichés and politically incorrect attitudes towards young women that today seem overtly sexist and cringe-worthy.